BSP supremo said on Monday that in past four-and-a-half years of governance, the BJP only did drama, towards Dalits. 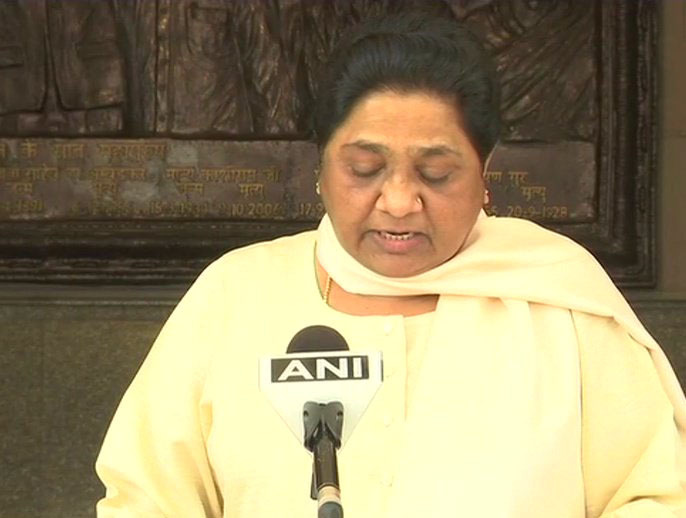 Lucknow: Bahujan SamajParty (BSP) supremo Mayawati on Monday lashed out at Prime Minister Narendra Modi for using Bhimrao Ambedkar's name and said that the Bharatiya Janata Party (BJP) chants the name of the Dalit leader but oppresses those belonging to the category. Addressing the media, the BSP supremo said that in past four-and-a-half years of governance, the BJP only did drama, towards Dalits. "They chant Ambedkar's name but oppress those belonging to the category. It's evident from the fact when Bhim Rao Ambedkar was made to lose when the BJP introduced an extra seat. BSP-SP didn't come together to fulfill selfish needs but to stand against the BJP's misrule," Mayawati said. She said that Prime Minister Modi speaks about B.R. Ambedkar but his mindset is stark opposite of what latter stood for. "That is the reason BJP and RSS were kept out of power in the past decades," she added. On Sunday, Prime Minister Modi in his monthly radio programme 'Mann Ki Baat' remembered Dr. Baba Saheb Ambedkar and said the Centre's development initiatives are in consonance with the latter's dream of India as an industrial superpower.